Did you know that BMF acquired its Nonprofit Status this year? The Bicycle Music Festival is now a 501(c)3 project of the San Francisco Parks Trust http://www.sfpt.org. San Francisco Parks Trust is dedicated to providing leadership and support for San Francisco parks, recreation centers, and open spaces. We at BMF are so grateful to be a part of such a great project and we look forward to our future work together! This means that your donations are TAX-DEDUCTIBLE! Yes!! Please support the festival by making your donation Here. Thank you to all of our current and future sponsors. San Francisco’s City Commissioner Ross Mirkarimi and the Board of Supervisors of the City and County of San Francisco have honored the Bicycle Music Festival with the City’s highest commendation: The Certificate of Honor. BMF thanks Supervisor Ross Mirkarimi and the Board of Supervisors for this great honor! 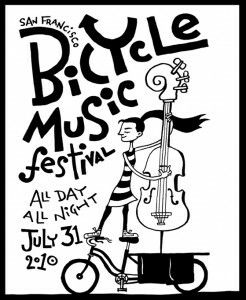 Here’s a great article/interview with BMF founders Gabe Dominguez and Paul Freedman about the upcoming Bicycle Music Festival SF 2010! Thanks to Sona Avakian of SF Events Examiner! If you’ve ever wanted to ride your bike through the city listening to live music (and who hasn’t?) July 31 is your next chance. This is the fourth year of the Bicycle Musical Festival, an outgrowth of Rock the Bike and it’s doubled in size each year. The festival is a roving, roaming troupe of merry musicians and all their music is powered by bicycle. Nothing is plugged in, no money goes to PG&E and no pollution is created. This year’s festival begins at noon at Speedway Meadows in Golden Gate Park with (among others) Diana Gameros, a puppet show and Sean Hayes. Then a LiveOnBike bicycle parade across the city will bring the festivities to Showplace Triangle at Sixteenth and Wisconsin Streets where The Derailleurs, Manicato and many more bands will play. Check here for the full schedule. I met Paul Freedman aka Fossil Fool, Rock the Bike’s founder and the Bike Festival’s co-founder/director at a mutual friend’s barbecue this past Fourth of July. I quickly hit him and co-founder/director Gabe Dominguez up for interviews. Avakian: Exactly how does pedal powered machinery work? Freedman: Normally on a bicycle the wheels are on the road, and when you pedal, the energy goes into propelling you through town. At our events, the rear wheel is lifted in the air with sturdy kickstands, so that we can tap the energy and convert it to electrical using generators. We then feed the energy into a pedal power utility box, which smoothes out the jerky nature of pedal power and makes it useful to our audio gear. S.A. What can one expect to hear and see at the Bicycle Music Fest? P.F. [The] festival begins in the morning when we load up hundreds of pounds of music gear and pedal power gear on our cargo bikes and trailers. We ride out to Golden Gate Park, and set up the Pedal Powered Stage, converting some of the same bikes we rode to pedal power sources. Our Pedal Powered Stage features pro-audio speakers that have been hacked to consume less power, so 6 people can easily get hundreds dancing. Our sound guy runs a recording studio, and is experienced working with pedal power, so he knows that when the pedal power is healthy, he can turn up the bass. This ups the dance energy and stokes the pedalers and the band—a positive feedback loop. We feature a range of talented local bands. We’re stoked to have Sean Hayes again at this year’s festival. We dispatch roadies on cargo bikes to pick up bandmembers and their gear, so that we can expose them to the joy of biking to gigs. After the last band performs at Golden Gate Park, our roadies will leap into action, packing up our festival and moving it by bike to our night venue, while our LiveOnBike performers will sing and play to the rolling audience. The LiveOnBike ride gives us a chance to share a taste of our music with thousands of onlookers along our route. S.A. Can you give a brief history of Rock the Bike and the Bike Music Festival? P.F. The Rock The Bike crew make up most of the Roadie corps, the Pedal Powered Stage crew and the Bike Blended Smoothie team at Bicycle Music Festival. In addition Rock The Bike is a sponsor. We raised $1000 for BMF this year through events, mostly the Feb 5 fundraiser we had at Cell Space. If people are jazzed about the Bicycle Music Festival and want to come out to events like it throughout the year, they should definitely get on our events list by fanning us on Facebook and joining the SF Cruisers email list. S.A. Would you explain what the beer (or soda can) pipe contraption is and how it works? P.F. The Pedalometer is Rock The Bike’s product for visually conveying the health of the Pedal Power system at events to pedalers, performers, the sound guy, and the fans. Since we can only use as much energy as we produce, it’s helpful if everyone can see whether the Pedal Power is looking good or about to run out. A 24 Volt DC fan blows air into a clear tube, lifting a carefully weighted beer can to different heights corresponding to up and down a tube drilled with holes of varying sizes. As the system voltage climbs, the fan blows harder, moving it past the holes in the tube and into different color zones. S.A. How do you go about recruiting people who can pedal fast enough to power things? P.F. Even a twelve-year-old kid can get 50 people dancing on our Pedal Powered Stage. One of our main reasons for doing this is to reach kids and everyday people in a positive way. Of course we have a few ringers on our crew, cyclists who climb Mount Tam for fun on the weekends, but the goal is to get our audiences to pedal power awesome local bands, regardless of their fitness level. S.A. Really? A 12 year old can pedal fast and hard enough to create a good sound that will make people want to move? P.F. Yes, I’ve street performed with this exact situation and people were not dancing out of pity. The beat this kid was able to put out was truly impressive. S.A. Learning to ride a bike is such a rite of passage in childhood. Who taught you/How did you learn? G.D. My dad took my sister and me down the street in El Cerrito to the local public school’s blacktop, and ran behind us holding the back of our bike seat to keep us from tipping over. He ran with us out there for hours—hanging on to the back of that bike seat. I’ll never forget the moment when I looked behind me expecting to see my dad running behind—only to see that he’d let go of me without my knowing it about 20 feet back, and there he stood, beaming! He also taught my cousin Yasi how to ride a bike that way. The years of family bike trips that followed, culminated for me in an epic ride I did when I was 10 years old. My dad and I biked from our new home in Provo, Utah, 45 miles to Salt Lake City. I felt pride in myself that I’d made it all that way, but I think I burned my little cycling engine out. It just felt too grueling an activity: the gruel/fun ratio was too far off for me. I started avoided bicycling whenever possible after that, becoming a dedicated rollerblader, and skating anywhere I wanted to go. When I was 23 my bike-phobia was still so great, that when my girlfriend-at-the-time and I were plotting to go to several WWOOF farms in Northern CA, I insisted that I travel on rollerblades. She (thankfully) pointed out that if I hit a rock going 20 mph on Hwy 1, with a heavy backpack on, I would become a human fly swatter and my face would never forgive me. After that first farm tour (on bike) I became a dedicated bike-touring dude, and the rest, as they say, is obscure underground history. Bicycle Music Festival has been awarded a Community Arts Grant from the Zellerbach Family Foundation. Many thanks to the Zellerbach Family and the Foundation for supporting bicycle music, from the community, by the community, and for the community.